Increasing Nutrient and Electrolyte Absorption, Improves GI Barrier Health and Superior Hydration. The image on the left shows the difference between a normal and damaged villi (blunted). The image on the right shows how pathogens and toxins can easily transfer across the cells when gut barrier function is damaged (leaky gut) . Substances ordinarily prevented from entering the body may be allowed to seep in and cause the body to react with an inflammatory response. While chemotherapy and radiation treatments act aggressively on the growing cancer cells, they also target and affect healthy non-cancerous cells. Among these healthy cells are those that are rapidly regenerating. The most sensitive and vulnerable of these cells are found in the GI tract, the mouth, and stomach. A section of the fast-growing cells found in the GI tract, that cancer therapy may affect are the villi (lining of the intestine). The role of villi is to promote absorption. A crucial area in the villi is located on the tip of the fingerlike projections, where glucose is absorbed. In a healthy villus, glucose is used as a transport mechanism to promote proper absorption of nutrients, electrolytes and fluids into the body. 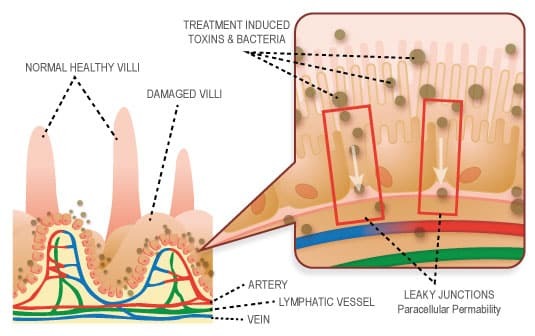 However, in patients undergoing the treatment of cancer, the villi may be damaged (blunted) and their absorptive properties are greatly diminished, leading to a reduced absorption of electrolytes, nutrients and fluids. Additionally, treatment of cancer can affect crypt cells (stem cells) by decreasing the rate in which they replicate. Blunted villi are unable to absorb glucose-bound nutrients. This results in poor nutrient absorption and dehydration. The select amino acids in enterade® help to rebuild the damaged villi and increase the number crypt cells thereby enhancing nutrient, electrolyte and fluid absorption. hydration, helping you manage the side effects of cancer therapy. This image shows an enhanced view of the healthy villi in the GI tract. The image on the right shows how the amino acids in enterade® enhance nutrient absorption and protect the gut, by tightening the gut barrier, supporting healthy immune function. enterade® Delivers Improved GI Health by Rebuilding, Protecting and Hydrating. Hydration is an important factor for anyone undergoing treatment for cancer. Proper hydration keeps cells healthy and promotes proper blood flow. As well, being dehydrated can increase weakness and fatigue, damage vital organs and decrease your overall well-being. What you drink is just as important as how much you drink. During treatment for cancer, it may be difficult for you to take in as much fluids as your healthcare provider recommends. Beverages containing glucose (sports drinks, soda, and others) may worsen dehydration, as well as increase some of the other GI side effects experienced. The image on the left depicts a view of a gut barrier junction that has not been damaged by the treatment of cancer (normal cell junction). The image in the center shows a view of damaged barrier junction, with a clear gap (where toxins can enter). The image on the right shows the repaired gut barrier junction with a tight barrier after taking enterade®. Note that it is tighter than the image on the left (normal/healthy cell), keeping toxins out and protecting the gut thereby supporting healthy immune function. Manage Cancer Treatment Side Effects Rebuild. Protect. Hydrate.